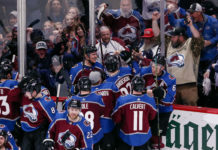 This weekend, LoDo will be filled with hockey fans, who will frolic to Coors Field to witness a once-in-a-lifetime spectacle, as the Colorado Avalanche will take their storied rivalry with the Detroit Red Wings outside, as part of the 2016 Coors Light NHL Stadium Series. Like the water of the mighty (well … last summer, at least) South Platte River, the beer and good vibes will flow throughout the Mile High City. More than likely, so will merchandise, as people look to commemorate the occasion. While hopefully sportsmanship and goodwill will reign supreme this weekend (though I wouldn’t be opposed to a fight or two on the ice), the festivities do unfortunately present an opportunity for something more sinister: getting ripped off. Yes, gathered amongst the attendees and jubilant hockey fans, there will likely be counterfeiters attempting to peddle their subpar merchandise to unsuspecting patrons. Luckily, the NHL is here to help you from being taken advantage of. “Our goal is to protect the fans and legitimate retailers from counterfeiters who detract from special events like the NHL Stadium Series,” said Tom Prochnow, Group Vice President, Legal and Business Affairs at NHL Enterprises, L.P.
Way back in 1992, the NHL partnered with The Collegiate Licensing Company, Major League Baseball Properties, Inc., NBA Properties, Inc. and NFL Properties LLC, to form The Coalition to Advance the Protection of Sports logos (CAPS). Since then, CAPS has been involved in the seizure and surrender of more than 11.1 million pieces of counterfeit merchandise– valued at more than $420 million. This weekend, the NHL and CAPS, along with local law enforcement, will have people around Coors Field on the lookout for counterfeit goods. Even so, people may be conned. 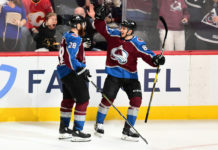 In an effort to help people protect better themselves, Kelly Lynch, associate counsel for Legal and Business Affairs at NHL Enterprises sat down with Mile High Sports. Andrew Demo: What do you think draws counterfeiters to events like the Stadium Series? Kelly Lynch: The fans are excited. 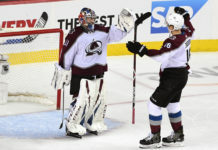 This weekend, the Avs and the Red Wings are going to faceoff in a big event, an outdoor game. Typically, counterfeiters will be eager to take advantage of fans’ excitement. Where they know there will be a lot of fans that are excited, they will be eager to take advantage and show up with typically low-quality, inferior keepsakes. AD: What is the NHL doing to try and combat such efforts? KL: Well, for instance, this weekend, we will work with law enforcement and go around the stadium to ensure that counterfeiters aren’t out and trying to sell merchandise to fans. All year long, we track down tips and we are constantly enforcing our rights when people are trying to sell counterfeit merchandise to our fans. AD: What can fans do to try and protect themselves from counterfeiters? Look for the NHL hologram sticker or hangtag. That will definitely identify something as genuine or official merchandise. Shop at legitimate retailers. 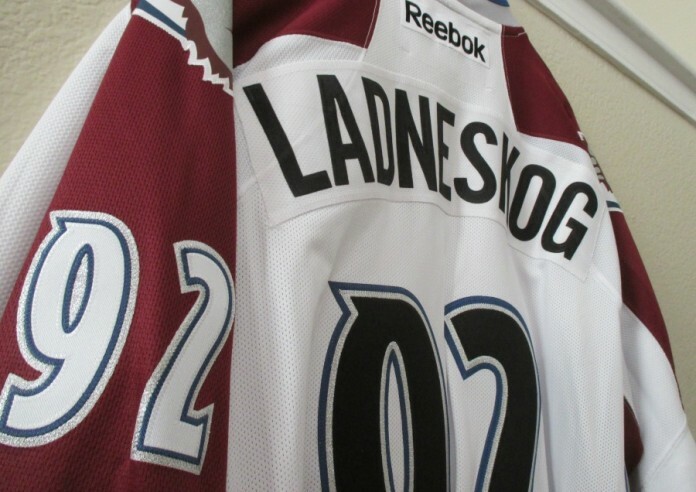 Go to places such as Altitude Authentics, which is the Avalanche’s official team store or shop.nhl.com, rather than buying items from street venders or people around the stadium selling stuff out of their backpacks or duffle bags. Beware of ripped tags or irregular markings on the apparel. At past events, we’ve seen counterfeits where they will have the roster on the back of a t-shirt, where the roster will be incorrect. We’ve seen player’s names misspelled. We’ve even seen t-shirts where it says “first name, last name” rather than “last name, first name.” We’ve seen incorrect dates. So we encourage fans to take a good look at the merchandise you are purchasing before you buy it. At the 2015 Winter Classic in Washington D.C., more than $25,000 in fake merchandise was seized. For those who think that good-natured Coloradans are above such illicit activities, think again. Earlier this month, when over one million gathered to celebrate the Denver Broncos’ Super Bowl victory with a parade, 361 counterfeit items were seized from 15 vendors. Unfortunately, that was likely after many, many fans had already purchased the products. If you are attending the Stadium Series games, protect yourself. Don’t be counted amongst those who were bamboozled. If you do this, then you can help ensure you have the best time possible.